Michelle Moore traces her initial back problems to the same accident that injured her son Ben in 2004. At the hospital after the accident, doctors told her she had a disc that was bulging slightly. She underwent physical therapy, some injections for pain, and soon was experiencing no problems. “I exercised, probably weighed a hundred pounds less than I do now, and was doing really good,” she says. Then, as she drove to a meeting for her job as an administrator for Rockingham County Schools in 2007, a car ran a red light, hit her minivan broadside and sent it careening down an embankment into a power pole. After she was treated and released from the hospital, she continued having pain. She saw an orthopaedist for the continuing pain for much of a year. 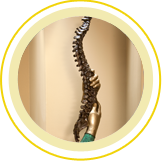 When nothing helped, he referred Michelle to Max W. Cohen, MD, FAAOS, founder of Spine & Scoliosis Specialists. “The reason he said he referred me to Dr. Cohen was because I was adamant that I did not want to have back surgery,” Michelle says. He said that Dr. Cohen was a conservative doctor, and he would only suggest surgery if it was the last resort. 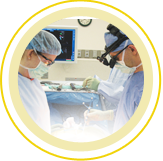 Dr. Cohen found that the “slightly bulging disc” from Michelle’s first accident had ruptured from the trauma of the second accident and the effects of degenerative spondylolisthesis. Over a period of months, Dr. Cohen had Michelle try injections and physical therapy, but her pain continued. Michelle wanted Ben to have surgery first so his pain was relieved and he could resume his high school baseball career. Ben had his surgery in December 2008. In June 2009, Michelle left her job, unable to work with the pain any longer, and began planning her own surgery. Surgery In January 2010, she had a spinal fusion from L4 to L5, performed by Dr. Cohen. He explained to me, “This is not going to take care of all your pain, but I think it will help alleviate it,” she says. I appreciated his honesty. If you go into it with that mindset, and you don’t think it’s going to be a miracle… well, that’s what made me decide, if I can get rid of any of the pain, even if it’s minimal, that’s better than having all that pain all the time. On the day of her surgery, Dr. Cohen impressed Michelle, not just with his surgical skills, but also with his compassion. That day, she recalls, her husband dropped her off in the patient admitting area while he drove with their four children and her mother to park the car. By the time he parked and got everyone back to the hospital surgery area, Michelle already had been taken to a pre-surgery area and – because this was during the H1N1 outbreak – the hospital would not allow her children back to see her. Afraid she might not survive, Michelle was in tears when Dr. Cohen arrived for surgery. She desperately wanted to tell her children she loved them. After finding out why she was so distraught, he looked for a solution – and prevailed upon the staff to locate a telephone. He waited to start surgery until Michelle talked with her children. After surgery, Michelle went through the post-op recovery quickly. She was able to go home from the hospital within two days of her surgery. Seven months after her surgery, Michelle is still recovering – it’s a year-long process – but thankful to be feeling so much better. Michelle has fibromyalgia in addition to arthritis, so she does not expect to ever be pain-free. One of the biggest changes since her surgery? She can lie down in a bed again. That worked okay at home – and she still sleeps in a recliner at home often – but when she traveled with her son Ben, a baseball player, to tournaments, she didn’t often find a recliner in the hotel room. She would have to sit up all night in a chair. “It’s wonderful when we travel now to be able to lie in a bed,” she says. This entry was posted in Success Stories and tagged Degenerative spondylolisthesis. Bookmark the permalink.